This skirt approach was recently played against me as a way of approaching the corner inside a framework. I had never seen it before, but a search on gobase.org revealed that it has been used by pros many times. So, when is this play appropriate, and what are the options for responding to it? Charles Matthews I use this play a lot in handicap games, as White. 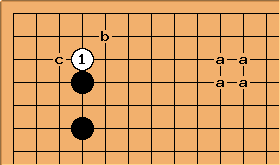 One can consider it as setting up miai at a and b, so that White can make progress in settling a group here. This makes reasonable sense when, as in the Fujisawa-Takagawa game, there is a black stone at the 10-4 point on the upper side. 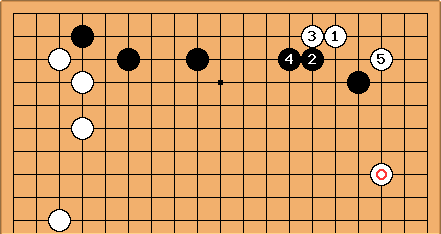 One powerful way for Black to play is to press down at c, taking influence. 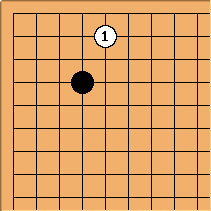 Black can play one or two points to the left of c, also. Alex Weldon: I understand the purpose of this play, except that I'm not exactly sure what makes it preferable to the more usual 3-3 point invasion. Could someone clarify, using the pro game shown above as an example? Is it so as to try to deny the opponent the opportunity to block on the wider side? Bill: Well, here is a different example, which may be a bit easier to understand. With White forms a base, with a good feeling. Black still needs a local play. If White invades at the circled point instead, Black a is good. Alex Weldon: Thanks. That essentially confirms what I thought... although san-san is often preferable, this "very low approach" allows the invader to choose the direction in which the invadee will get thickness, whereas san-san allows the invadee the choice. 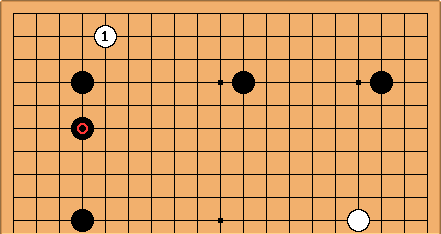 Here, Black would very much like to get a wall in the top right facing towards the left, but the invasion at allows him to, at best, get one facing down the right side, which isn't as useful. Right? 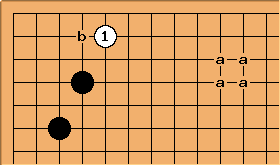 This sequence, though not held in as poor regard as when I was learning go, gives a more cramped feeling for White. Also, Black can extend further on the right side. Charles Matthews Yes, one can find examples similar to Bill's where this move is utilised by top pros. But in the cases I've seen White has already played to neutralise Black's influence. This is taken from Otake Hideo-Sakata Eio (B) 1969-12-08 in the Judan match. White already had the marked stone in position, as part of a stable group. Otherwise playing from that side at all goes against the approach on the open side principle - one can question what White could do there other than create a weakish group. 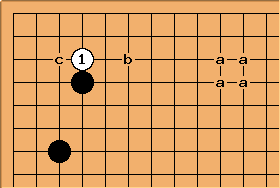 One could also expect White to play this way as a deep invasion in a well-fortified framework, such as this one. But that's a different kind of discussion. One more thing to add. The very low approach is most often used against a knight's move enclosure. Charles A notorious example was Seo Pong-su-Otake Hideo 1993-05-20 in the decider of the 2nd Ing Cup final. Against the large knight's enclosure White will normally approach at b or plunge straight in at c if there are no black stones around a. When there are such stones then the attachment at becomes the preferred approach. The attachment also seems the more common choice against the 4464 enclosure although both the low approach at b and the 3-3 invasion at c appear as well. When there are no stones yet around a yet White seldom approaches the enclosure immediately, but rather plays around a herself. The contrast between this and the cases of the small and large knight's move enclosures is clear in the data. I have seen it once or twice in professional play, and played it once myself when I had a strong wall on the left side. If I played on the 3-3 I was afraid that he would block to the right, for what it's worth. Charles I was actually wondering about this one, with only a 4-4 point present. Very rare, it seems. There are a few examples where it is played by top Koreans.